Editor's Note: This "Pirate Time Machine" feature article was originally published exclusively in print in last summer's Bonesville Magazine. This is the first time the article, which is reproduced here with permission, has appeared online. Click the thumbnail image (left) to view an enlarged screen-capture of the magazine's cover. As a Pirate football player in the early 1960's, Jerry Tolley was an extraordinary kick returner, a wingback in the vaunted Stasavich Single Wing, and a mainstay in a defensive backfield that still holds two all-time records at East Carolina and a seat in the school's athletics Hall of Fame. 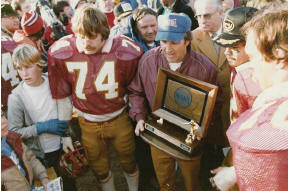 As a collegiate coach at Elon, he led the Fighting Christians to two NAIA National Championships. As a pioneering author, he has penned several football coaching and strategy books. Along the way, he has managed to squeeze in a term as mayor, lead an effort to build a unique handicap-accessible environmental park, serve as a corporate vice president and lead the effort to build a foundation at Elon. In his free time… he is an avid tennis player and landscaper. If you get the sense that his motor is constantly revving on the high side, you have pretty much figured out Coach Jerry Tolley. Though the town and college of Elon, North Carolina, have been the largest benefactors of Tolley’s lifelong effort, there is no mistaking where this born leader honed his skills, philosophies, and gumption. He is a Pirate in every sense of the word and is the first to credit his experiences on the field, among the coaches and within the Pirate family for making him the effective leader he has been for the 40+ years he’s been away from his alma mater. Hailing from a small community in Edenton, NC, Tolley’s life has been dedicated to making a difference in small communities like then-East Carolina College and Elon where he has been a mechanism for change since settling in back in 1967 when he became an assistant coach of Red Wilson’s Fighting Christians football staff. With all of his accomplishments following his career at East Carolina, it is easy to forget that Tolley, as a player, was a talent in his own right. Growing up in a small town like Edenton, where at the time the population hovered around 5,000, suited the young Tolley who thrived athletically in the tight-knit town. While he played sandlot baseball and football, Tolley pointed to eighth grade as the year he found organized football and after that, it had his heart. Though his actual coaching career was merely a future calling he was yet to hear, it was a coach to whom Tolley gives the credit for a stellar prep career at John A. Holmes High School. Not only did the small town of Edenton afford Tolley to be a multi-sport start at his high school (he was a standout in basketball and track as well), it allowed the town to part-take in the prep program’s success in a way that just doesn’t happen in larger towns. On the football field, the smallish Tolley was a bonafide small-town star. 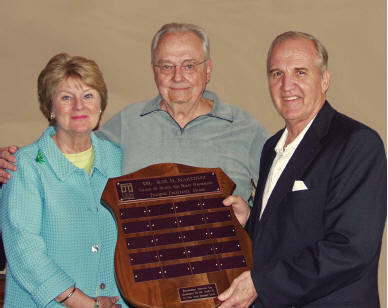 Along with the state titles, Tolley capped his prep career in 1960 garnering all-Albermarle Conference, all-East, honorable mention all-State, and Sporting News All-America recognition. As a player, he set state records for career yards per TD carry from scrimmage (33.4 ypTD on 21 TDs), season yards per TD carry from scrimmage (42.3 ypTD on 12 TDs), season total kick returns for TD (6), season most punt returns for TD (5), seasons most interceptions (12), season most games intercepting a pass (10), and most punt returns for touchdowns in a single game (2) – a record that still stands today. With just 25 guys on the team, the better players played, and played, and played. “Everybody played both ways in high school,” Tolley said. “I played defensive back and running back. Well, I don’t know what was (the most thrilling thing about the game was to me). We just had outstanding offensive teams. My senior year, I think we averaged about 42 points a game and averaged giving up about 5 points a game. While the town took note of his exploits on the field, at home it was a different story. In the Tolley household, academics ruled the day. Though football was the mechanism by which he went to college, Tolley’s collegiate experience served as an inspiration to his siblings. His siblings excelled school and Tolley points to Roland, the brother just younger than he (who is now deceased) as “graduating with more honors from East Carolina than all of us.” Tolley acknowledges that as a young man, most of his learning came on the football field. So impacted by his prep experience, his high school coach was one of those mentors that Tolley called on his former coach Billings for his forthcoming book. Tolley cherishes to this day, his Edenton football years and says football is – more than anything – a context by which memories are framed. “Well, you know, I think football and sports in general, what they do is they give you a lot of memories and especially team memories,” Tolley said. “Of course, they also give you a lot of life-long friends. But as I was thinking, some of the records I held at Edenton High School, I didn’t realize I held those records until about 25 years later because, you know, Edenton just didn’t keep them. Tolley is quick to point out that his lasting exploits were as much a result of his coach’s ability to coach, as it was his stellar abilities. “I always had visions of going to Duke … I just wanted to go there for whatever reason,” Tolley said of his dreams of college football when he was a teen in Edenton. “There was a great football player and then he was a coach at Duke named Ace Parker. Ace Parker after our senior season – one where we won the state title and we were 13-0 – and I had made the All-East team and the All-Conference team and scored a lot touchdowns. I figured I was destined for Duke University. Though his dream of being a Blue Devil was dead, his dream of being a big-time college football player was not and the Pirates of East Carolina College made that happen. Though East Carolina had never been in the forefront of his mind, it quickly moved there. He recalled heading up for his first days as a Pirate. And football itself was quickly redefined for the young prep star. “When I got to college at the time, everybody was so much bigger than I was,” he said. “I weighed about 142 pounds and was about 5-9 and one of my best friends on the team was Bill Cline who was an all-American and played Canadian ball and everything and I think he outweighed me by five pounds – he was about 147. When we saw all of those big guys…I mean one of my all-time favorite football players at East Carolina was Tom Michel. He was about 6-3, 220 pounds and could outrun me. A red-shirt freshman season begat big changes in the Pirates program and Tolley noted it closely. “You know, the whole freshman year we were red-shirted under Coach Boone,” he retold. “I remember we were playing Lenoir-Rhyne and if I remember we had Lenoir-Rhyne beat, but then they got the ball in the last two minutes of the game and they drove it down the field and won the ball game. Nobody at East Carolina liked Clarence Stasavich. They just…Lenoir Rhyne…he always came over and they always beat us. Under Stasavich, Tolley came out of the gates flying high and looking like the next great wingback in Stas’ electrifying Single Wing. “I had an outstanding offensive year my sophomore year. I started every game,” Tolley said. “Most of the games I was playing 50-60 minutes a game. I’d just come out a couple times. I was on all the punt return and kickoff return teams. One of the things I achieved at ECU is that I still hold the record for career kickoff return yardage for average and for season, especially that sophomore year. Though he was injured, it didn’t prevent him from electrifying the Pirate crowd now and then and when Tolley got his hands on kick for return, the fans took note. One of those touches is still in the Pirates record book as one of the longest kickoff returns…with a twist. It came on a 92-yard kickoff return against Western Carolina. His junior season saw a marked shift in his responsibilities on the football field. His sophomore season would mark the last time he would regularly tote the football for the Pirates offensively. By his junior season, Tolley had a sort of plan mapped out for his future. “If I had ever quit playing football, I would have continued to go to East Carolina,” he said. “About my sophomore year, I noticed a couple of senior players would always stay around and help coach the team. I decided that I wanted to do that as well. It was very helpful because you got to sit in the coaching sessions and you learn it from a coach’s standpoint. I was never one of those players who after I gave up playing that I felt like going back and playing. I felt like I had done all I was supposed to do. While at East Carolina as a player, Tolley also competed in track as a two-sport athlete. Tolley reflected on a number of his favorite personal moments as an East Carolina football player. “The first kickoff I returned for a touchdown was my very first game as a sophomore,” he told. “It was an 82-yard return against the University of Richmond and that was a great thrill for me. As I remember it today, I tell people, I say, I don’t even know if I opened my eyes until I got to the 50-yard line. All of the sudden I remember seeing a kicker there and the goal line 50 yards away. And for some reason I got past him and that was a very, very thrilling moment. His best game as an individual? Tolley also reflected on a few of his teammates. “My favorite player…surely Dave Alexander, who was my roommate,” Tolley said. “He was an All-America who played a year after I did. He is a wonderful person and was a truly great, great fullback. I mean he could pass, he could run, he was just outstanding. Of course there was Bill Cline was an All-America tailback when I played wingback my sophomore year. Though he had some offers to play post-collegiate football, Tolley never bit on anything that would have been less than a legitimate pro league. As he decided as a sophomore, Tolley stay at East Carolina in the year after he graduated. The step over to Elon was one that in retrospect was seemingly nothing more than a young coach taking an opportunity that fell in his lap. It turned out to be an opportunity that when set the stage for a greater than stellar coaching career. He had been with Wilson for his entire tenure at Elon and recalled a moment when he almost left. It was a moment that solidified his fate. By age 39, Tolley had become a legend in NAIA football and cemented himself among the great coaches of all time. Though he always expected he would be the next head coach, when it happened, he was very pleased that the entire Red Wilson staff greeted the decision positively. He took it to heart and thus took on more of stoic face to his team. Tolley took Red Wilson’s good program and elevated it to elite status, leveraging a coaching staff that rivaled many in college football for tenure and cohesion. His staff and fielded a program that represents the greatest of times at Elon and in NAIA football. Tolley doesn’t like to separate his tenure from Wilson’s when it comes to the history of Elon and won’t. “There were two great eras of football at Elon,” he said. “One was in the 1930s. From 1932-1941 they won five conference titles. There was a coach there, Peahead Walker. He was a great coach at Elon and then he was a great coach at Wake Forest and then he was a great coach up in the Canadian Football League. Notice that Tolley includes his own tenure along with his mentor. Those two championships came on Tolley’s watch. 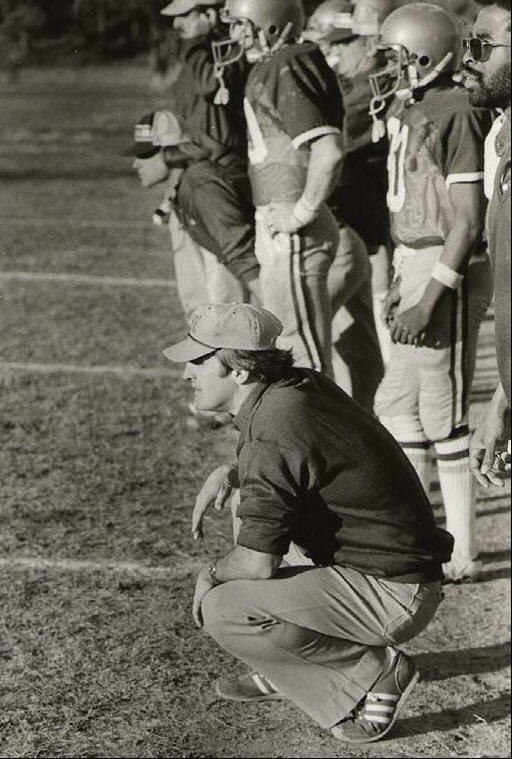 Tolley’s tenure as the head coach in 1977 launched truly another era of Elon football that merits its own place in the hierarchy. That ’77 team posted a very respectable 9-2 mark, but missed the NAIA playoffs. Then the ’78 team made its way to the NAI A Championship game on the strength of an 11-2-1 campaign. Though the team fell in the Finals to Angelo State, the Tolley era was well under way, despite a bit of a bumpy ride in 1979. Though Tolley never doubted his program, he knew that he needed to ensure that he had no cracks in the ranks. Enough said. Tolley and his staff went back to the drawing board. Of course, that season, he followed the opening game road loss with 13 straight wins, culminating in the 1980 NAIA National Championship title with a 17-10 victory over Northeastern State. As a coach, Tolley was a realist, recognizing that there is a certain amount of happenstance that must be had alongside preparation, talent, discipline, and conditioning. Some might call that happenstance the ability to ratchet up your game when you most need it, something that Tolley’s teams always found a way to do. It was the 1981 championship Tolley was describing… a game that netted a back-to-back National Championship. That 3-0 win over Pittsburgh State to secure the 1981 NAIA National Championship was bittersweet for many of the Fighting Christians fans. The victory put the school’s football program in a place few others on any level have been. Yet, it also meant the end of the Tolley era. In retrospect, the championship games were no different that scrimmages at practice to Tolley. You might think that walking away from the game would have been difficult for Tolley regardless of his commitment to retire by 40. It wasn’t. “It really was that easy for me to (leave coaching),” he said. “I was just three chapters away from finishing my dissertation. I don’t know...my boys grew up with football. One of them was born in 1974 and one in 1977 – during my first year – so they always were around the team. One of the things we always did was that my boys came on the field during practice and the other coaches’ sons and wives would always be around. It was always a family atmosphere around (the program) and my boys grew up with it and they might have wanted me to coach a little bit more so that they could be on sideline and doing things. There was really no other coaching job at that point that would have kept him in coaching, but Tolley did admit that he once made an inquiry to East Carolina. “I called down to ECU one time,” he told. “After our 5-5 season, East Carolina was looking for a coach. I called down there and said I might want to be considered for that job if they were looking for a coach with East Carolina blood who wanted to coach East Carolina. I said, ‘You’ve been bringing in these coaches like Pat Dye who are wonderful coaches, but they aren’t going to stay there because they wanted to go some where else. I was down in Charlotte at the Shrine Bowl and was calling from there and they said ‘You call us back tomorrow because we are making that decision right now on whether or not we want to get an East Carolina guy or somebody else. When Tolley walked away from coaching following that second national title, he hardly walked off into the sunset. In fact, he really was just getting started. Earlier, while he was still coaching, Tolley became a published author, writing about what he knew best, coaching football. “While I was coaching football, I would write all these articles,” he said. “The first one was that we always ran the Single Wing and the title of my first article was…it was 1970, was The Swing End Offense. I was an offensive coach at Elon for the Single Wing. We had a big old tight end – Rich McGeorge – who was a No. 1 draft pick for the Green Bay Packers and we had a pretty good old tailback. So, I submitted our passing game from the Single Wing. Some basic plays and things like that and some guy with…I think it was The Athletic Journal… was an old Single Wing guy and he liked the article. He came down with his camera and took a bunch of pictures. I had a good old friend who was in the English department and I wrote this article and I had him check it to make sure everything was spelled right. Matter fact that guys is still my friend, went to a ball game with him last night… name is Dr. Phil Owens. That was just the beginning of what has turned out to be a successful writing career for Tolley. “When I do these books now, I edit the book,” he said. “I write hundreds of coaches and tell them what kind of drill I want and they’ll send them in and I will rewrite that drill. A lot of the coaches, their strongest suit is not writing. They can tell you everything but they can’t write it down. You really have to understand football to write down what they are trying to convey. The guy with Parker Publishing Company, he said, ‘Guess what? You do the book; I bet you could make $10,000. That first book went on to sell more than 16,000 copies. Tolley’s second book, 101 Winning Football Drills from the Legends of the Game, published in 2003, contains successful drills Tolley has collected from the greatest football minds of the modern era. The coaches who participated for Tolley included Penn State head coach Joe Paterno, Ohio State head coach Jim Tressel, former Nebraska head coach Tom Osborne and legendary coach Paul "Bear" Bryant (posthumously), who is featured on the book’s cover. "To be included," Tolley said, "a coach had to have won at least 100 games, won a college national title or have won national coach of the year honor." The writing continued past his retirement from coaching in continues to this day. And, of course, there was the new job. Powell’s offer was too much to turn down so Tolley stepped away from his beloved Elon. “I worked (at Roche) 12 years and then retired,” he said. “When I retired, Elon was building its first on-campus stadium and I came back as Major Gifts Officer for the stadium and then I moved (back) into Director of Annual Giving and I have a real good staff and we raise money. I am always goal oriented and this little fund I am responsible for when I took it over it was a $770,000 a year and this year it will be $4 million years later – we are going to be at $1.5 million so we doubled it 100%. Our goal – our New Century Goal – was only $1.25 million and we hit that five years early and they just raised it. I think (what motivates me) is the goal. When I talk to my boss I said, ‘The one thing football teaches is that you always know where the goal line is.’ The one thing I know is that when I get the weekly reports, I know exactly what our goal is, I know how we are getting there and what we need to do if we need to get there faster. And while he does not coach now, he is every bit involved in football Saturdays at Elon, attending the games, pressing the flesh, and taking part in what he considers the greatest fun. Tolley has always been a people guy so it shouldn’t surprise anyone that among his interests has always been community involvement. It makes since, giving what he does for a living. And, so he dabbled a bit in politics throughout his life. Well, maybe a little more than dabbling. “So I said, ‘Ok, I’ll run.’ I had name recognition so I ran for the board and won a four-year term and then ran again and halfway through that one, I ran for Mayor and won. And then I ran one other time and could probably still be mayor today but there comes a time you got to let someone else take over. It was a great experience. Through it all, Tolley has had a strong wife, Joanie, standing by him while he pursued all of his dreams and raised his two boys. “My youngest son had 15 letters in high school,” Tolley proudly said.” He played soccer and football. Both my boys were soccer players and both of them kicked for football. But the youngest one was a pretty good track star, pretty good basketball player and kicked for the football team. My oldest one, he kicked on the football team and kicked for the U.S. Naval Academy and started two or three games there. He played for them three years and had a good career. The oldest one was an all-state tennis player in doubles. And now that he is getting home earlier after work, he has time to partake in a couple of his favorite activities. Tolley admits that of the titles he has had the honor to own, there are none better than that of coach. “I just love being called coach,” he said. “I talk to the assistant to the president and she always calls me coach and I say, ‘You know, I really appreciate that.’ And one of the things I do is wear a baseball cap all the time and it says Elon-something on it. I only wear it during the winter because it keeps my head warm. And she always said, ‘You always wear that hat so I call you coach.’ (Wearing the hat) brings back a lot of memories all the time. His coaching has netted him too many honors to list. Two years ago he added another, the prestigious Laurel Wreath Award, given by Governor Mike Easely for being a North Carolinian who has delivered exceptional performance in athletics. It was his coaching, Tolley insists, that landed him in the 1991 ECU Athletics Hall of Fame, an honor he is very proud of.